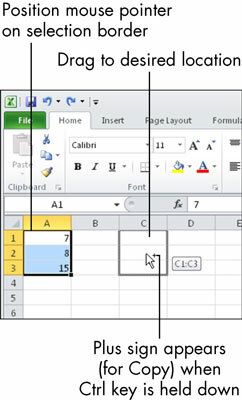 When you’re creating an Excel spreadsheet (or worksheet), you may place your data in a cell that you decide later that you don’t want it to be in. Fortunately, moving content between cells in an Excel worksheet is easy. Clipboard: Choose Home→Clipboard→Cut or press Ctrl+X. Then click the destination cell and choose Home→Clipboard→Paste or press Ctrl+V. If you want to copy rather than move, choose Copy (Ctrl+C) rather than Cut. If you’re moving or copying a multicell range with the Clipboard method, you can either select the same size and shape of block for the destination. Or you can select a single cell, and the paste will occur with the selected cell in the upper-left corner. Mouse: Point at the dark outline around the selected range and then drag to the new location. If you want to copy content rather than move it, hold down the Ctrl key while you drag. 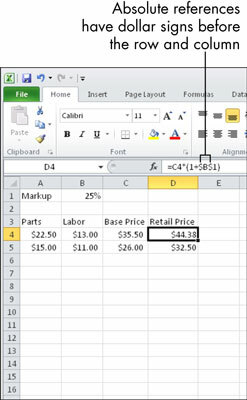 When you move or copy a formula, Excel automatically changes the cell references to work with the new location. For example, suppose that you copy the formula =A1+A2 from cell A3 into cell C3. When that formula arrives at C3, it changes to =C1+C2. This change happens by design, as a convenience to you, because often when you copy formulas, you want them to work relative to their new locations. This concept is called a relative reference. Sometimes, you may not want the cell references in a formula to change when you move or copy it. In other words, you want it to be an absolute reference to that cell. To make a reference absolute, you add dollar signs before the column letter and before the row number. So, for example, an absolute reference to C1 would be =$C$1. You can mix relative and absolute references in the same formula. For example, if I copy the formula from D4 to D5, the version in D5 will appear like =C5*(1+$B$1). The C4 reference changed to C5 because it didn’t have any dollar signs around it, but the B1 reference stayed the same because it did have the dollar signs.